On Tueday September 8, 2015, we released a quarterly version of Apigee Edge Developer Services Portal for Private Cloud. Warning: If you have already been using SmartDocs during the beta period, you'll need to upgrade. See the next section. When purchasing a plan that overlaps with an existing plan, the page shown is now formatted nicely for the user. Fixes the issue that renders the template parameters un-editable after sending the request from SmartDocs after deleting the template parameter in the method documentation. The email address field in the edit profile page will not be disabled anymore and developers can change their email addresses. Under Modules, "Dev Connect Mint" was displayed twice. This is now fixed. 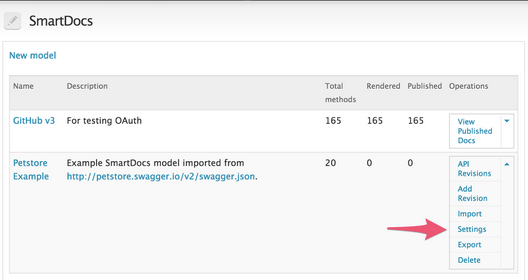 WADL files can now be imported via URL and Swagger files can be uploaded. 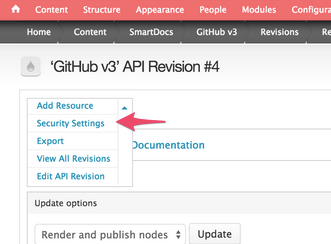 SmartDocs is now located under the content menu, and the smartdocs settings are under the settings admin menu. This is a bug that only affects Monetization customers with custom code calling the toString() method. SmartDocs now imports the petstore swagger example during site installation (http://petstore.swagger.io/v2/swagger.json) instead of the weather model in order to have a more exhaustive example of using SmartDocs. When running Drupal cron, a large amount of developers would cause a timeout issue. When an org has more than 200 users, a batch process is now used. Added better error messaging to installer when Edge management connection is not working to minimize troubleshooting issues. These allow custom modules to alter the developer app analytics chart. Dev Portal SmartDocs now comes by default with a link to the SmartDocs rendered documentation in the main menu named "APIs", which links to any models with published methods. You can now set the "Body MIME type," "Body documentation" and "Body sample" when you edit a SmartDocs page. The API Documentation page that is shown when clicking "APIs" in the menu was showing the model's internal name instead of display name. If you are updating to the release and you have changed this view, you will need to revert your view to see these changes by following these steps: # Login as an administrator # Go to Structure > Views # Click the dropdown next to "Edit" on "SmartDocs Models" to see all operations. # If you see "revert", then you have overwritten the code w/your own change. Click "revert" to put the view back to the default state. Note that this will remove any changes you have made to this view. A bug in which the Edge connection timeout settings were not properly applied was fixed.